In my country of Canada, December is the darkest month of the year. When I leave home for work it is dark. When I am leaving work for home, it is just starting to get dark. From the website “sad”, it mentioned that 200 years ago 75% of the people worked outdoors, now 10% of the population work in natural outdoor light. For me, S.A.D. or “Seasonal Affective Disorder” is very real, and working in a windowless warehouse, I try extremely hard to keep on top of it. When not working, I am often found to be outdoors as much as possible. And although this is not natural light, I also do enjoy Christmas lights people have put out for others to enjoy. I even alter my driving route coming home to take more and varied lights. With Christmas just around the corner, Christmas lights bring me so much joy. For advice on all types of depression (including SAD), please go to the website Better Help. 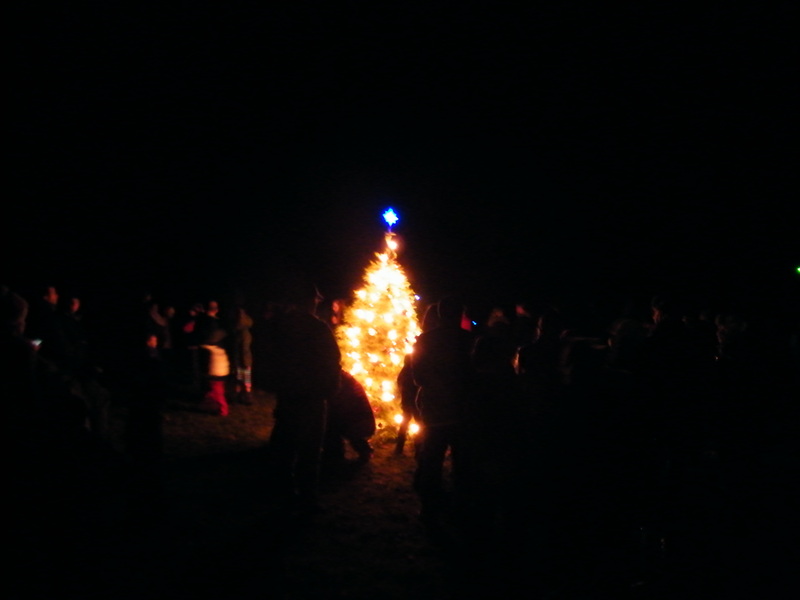 A couple of weeks ago my home village held a 1st annual tree lighting. It was very well organized, thanks to many hard working volunteers. You could bring an ornament to decorate from home, or use an ornament provided. The firefighters collected food items for the food bank. After we met in the community hall for hot chocolate and treats. 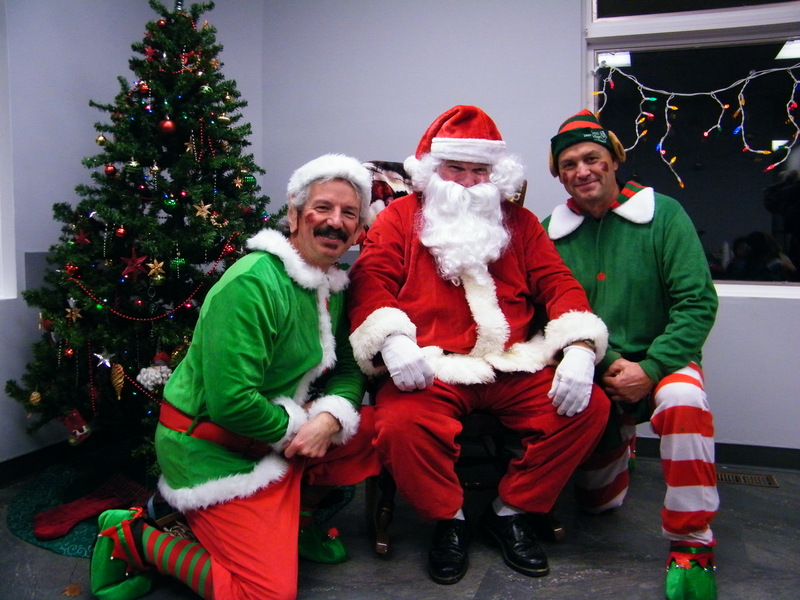 There was even a visit from Santa Claus. When Santa arrived and walked down to where everyone was gathered, he gave me a subtle shoulder check and a “Hi Carl.” He is a lifelong friend starting from my childhood days, and the father of one of the hard working volunteers. He is not from the local community, and would not have been known to most people in my village. My village has been a great place to live and raise a family. We have lived here in the same house for the past 23 years. My children have made great friends. When we meet someone on the street there is always a greeting, whether through a wave or a hello. People really seem to look out for one another. But I know when I talk to people who live in the bigger cities, this in not the norm. I am extremely fortunate. 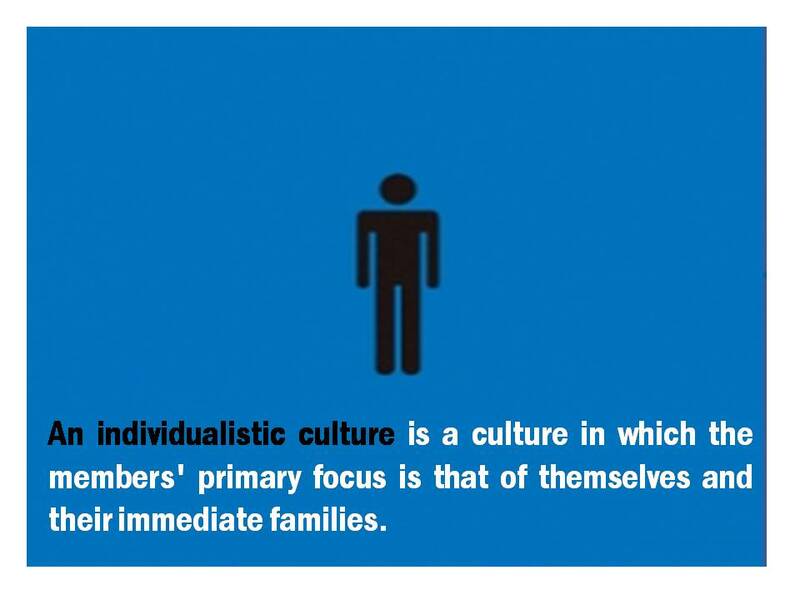 More and more our culture is becoming individualistic, which means that our society values themselves and their own needs over others. American Vice President Joe Biden has once quoted, “For too long in this society we have celebrated unrestrained individualism over common community.” With a 1000% (or 10x’s increase in major depression since 1945), I am wondering how much our individualistic society has contributed to this. We have lost the common community mindset. I grew up on a family farm, and the rural farming community was SO close. We helped each other at harvest time. We met each others need for emotional support. People attended local churches within their own communities, and they were full! It was normal thing to do, and within the church community everyone had that “helping mindset”. Things have changed so much since I was a kid, and unfortunately not for the better. Sadly many times, many of us do not know who our neighbours are. A person may have people all around them, but still be very lonely. In traditional Amish society in the US, major depression is almost unknown. Why is that? My guess is because they are a common community that deeply supports one another. That and along with them being known for living a much simpler, slower paced lifestyle. We live in such a fast paced society. I wish we could go back to the days of my childhood. Living a slower pace, and where everyone knew each other, and supported one another within our own communities! Image source! One of my fondest childhood memory was a Saturday night with my dad at the Edgar General Store. My mom would make out our grocery list, and my dad would bring it the General Store and hand it to the proprietor’s wife. She in turn would gather up the groceries while the farmer neighbours would gather in the back room to watch the hockey game on the small black and white TV. Sadly, when supermarkets became the norm, the demise of the local General Store became very quick. 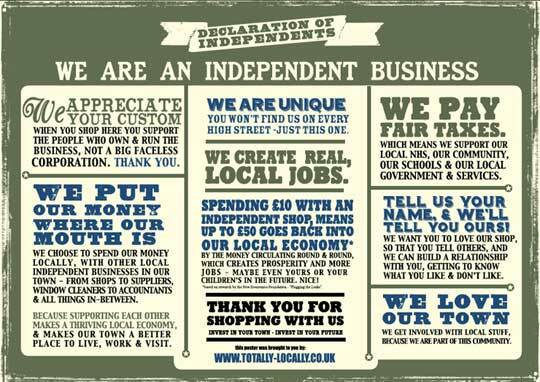 An infographic created in the UK, but can apply anywhere there is local independent business. Now with the gaining popularity of on-line shopping, more than ever it is important to support our local businesses by shopping locally. They really need our patronage to survive. Image Source! For my mom, she had her emotional needs met through a few areas. Two of them were the local church, and the Women’s Institute. When I was growing up, the Women’s Institute played such a MAJOR part within the local community. They had their monthly meetings, but in reality connected FAR more frequently. They organized local social events such as “Strawberry Suppers”, provided a food corner at farm auctions, and were active if there was an injury, sickness or death within the community. No one “fell through the cracks”, and people’s physical and emotional needs were met. They are not a professional government run agency in the city, but are a group of hard working predominantly non professional women from within the community, and who have a heart for the community. Women’s Institutes still operate within rural communities, but they are really struggling to keep operating, and are having a very difficult time attracting younger members. In my own village of Hillsdale, there are several on-line communities to help connect people, two of which work on-line and work within the community. It is a HUGE undertaking to promote a simple Christmas tree lighting ceremony to a village of individuals that for the most part work, shop, entertain, exercise, socialize, play and many times worship in places outside the local community, and pull it off. So it did my heart SO much good to see this little village where I live attend in such full force for the 1st annual Christmas tree lighting ceremony. Neighbours were meeting and introducing themselves for the 1st time. Old acquaintances were reconnecting. It was a very happy occasion. Thank you to the many volunteers. The Hillsdale Community Group, The Hillsdale Fire Association, and others, for your many, many hours you diligently and tirelessly work at, endeavouring to keep our little village connected as a community. What “community”, such as a running community, church community, social community, or your town or village community do you really feel a part of? Is short days and Seasonal Affective Disorder a problem where you live? What changes has there been in connecting your own community….for the better….for the worse? Lights along a street in my home village in the pre evening hours! 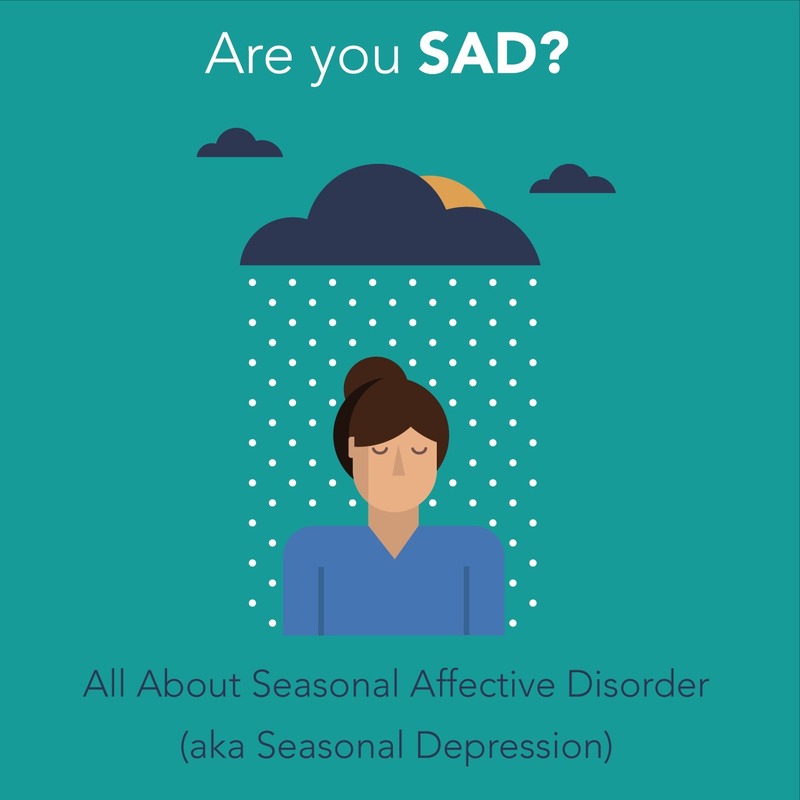 A summary of Seasonal Affective Disorder with symptoms listed can be found here! Loved reading this! What an interesting stat about U.S Amish communities. 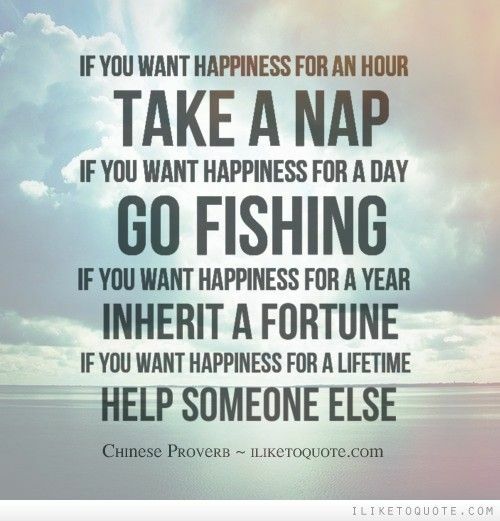 I guess simple and basic living without the stuff we think we need to function goes a long way. I suffer from S.A.D. It typically hits me around January when the cold and dark is getting too much for me. I really appreciate you sharing this Charlotte. It is always important for each of us to know that we are not alone in this. Seasonal Affective Disorder seems to be getting worse for me as I get older. I ended up purchasing one of those S.A.D. lights, which does help The big thing for me is getting up early enough to use it. I am often rushed to get out the door for my commute. One person I know has had an office job, so she just sets her light up on her desk and works away with the light on during the 1st 30 or so minutes of her day at work. There is much good to be said about the Amish. In Southern Ontario where I live, there are rural communities that are known as Mennonites. Similar to the Amish in beliefs and lifestyle. When I see them riding along in their horse and buggy, often I am a bit envious of them. I don’t like the short days either. It doesn’t get that dark at 5pm here. 6 pm it’s dark dark, but in the city it’s never dark! It’s crazy to say that when I’m visiting my parents in the UK where they live are few street lights and I kinda welcome the dark slightly. Next Tuesday’s the shortest day in the Northern hemisphere so it can only get brighter from then on! Have you thought about a light lamp? I’m lucky in Barcelona it’s generally sunny most days, but I remember in the UK, the even shorter grey days got to me. Just read your last comment. Do they do a portable light, so you could use it while you’re driving? But if I’m right it doesn’t work that way! But there has to be one you can alter! Yes, pretty soon we will meet the winter solstice, and then the days will indeed be getting longer. The S.A.D. light box I have for my therapy is quite large, and bright it would be hard to use driving. It would be cool if I could use it this way. I’ll just have to go to bed earlier, and get up earlier…haha! Always have that mind picture of “sunny Barcelona”, and it is so wonderful that you have the sun like that Natalie. Very beneficial for your health and well being! It is more sunny here however this year I’ve noticed it’s a lot more overcast. The sun may be around in the mornings then hide behind the clouds until just before sunset. Some days it’s fine clouds, other days it’s blocked out! Perhaps a result of climate change. Another thing I find that helps with winter blues is wearing lighter colours. Colour plays a huge role with our moods. The past 3 winters I’ve worn more winter jumpers, avoided blacks, greys (brown I never wear) and all the winter colours. I swear it helps when the day’s grey, rainy. Even a pop of colour can make you feel better! You’re right, the low level lighting does play with sleep patterns. After a while you get used to them. That said, if I stay in a hotel, around my parent etc, I’m not used to those street lights and it affects my sleep until my body’s accustomed to them. It doesn’t help I sleep with the blind up, but I prefer the natural light to wake me up (okay, my alarms plural as it takes that many!). I have never heard or thought about this Natalie, but it really makes sense. I often think of lighter colours for spring and summer and darker ones for fall and winter. Thank you for sharing this, as I am going to change into lighter colours. I know they really do affect moods. No worries! Happy to help! I’ve even transferred this thought in my ‘interior decorating’. A lot of white and gold with pops of bright and tropical colours. Complete opposite to my Mum and Sister, but again, for me it’s calming and energising when I need it. However the kitchen is mostly all black, not much natural light and if I’m honest, it’s kinda depressing in there! Aww, what a lovely post Carl, I really felt the sense of community your village has and the excitement your tree lighting ceremony brought. We have a community Christmas parade which is nice but the event that gets me most in the Christmas spirit and that provides fellowship is when I go to my friend’s caroling party. Anywhere from 15-30 people get together for food and drink and then we canvas her neighborhood singing carols. Most welcome us and it’s all in good fun even though some keep the lights off and pretend they are not home. Lovely! am African and we really do not have all those ‘christmas lighting’ ceremony! what we do have is wonderful carols and family day out were you get to connect with individuals and eat, drink and laugh. Thank you so much for reading and your comment Itofa. It was great to get your input and perspective from Nigeria. and how you connect with others around Christmas. It sounds like much joy and happiness. Until this year I have always thought houses decorated with Christmas lights were sooo suburban and ‘beneath me’; my ridiculous opinions restrict me. 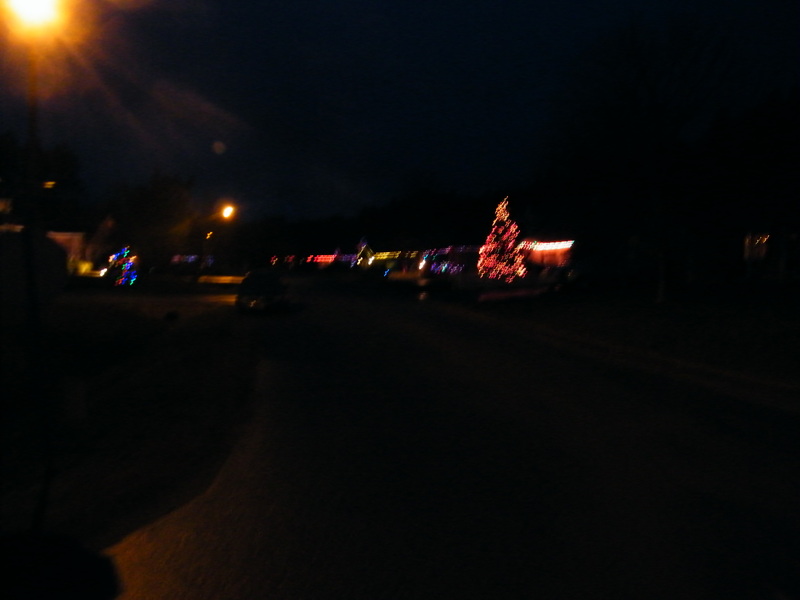 A week ago two of my neighbours garlanded their houses and after dark my cul de sac glowed – except for my ‘dark’ block. I was inspired by their displays and now I have lots of sparkling stars (solar – which I realise wouldn’t work in Canada at the moment) that front my property. And I have never been happier. I can only imagine adding the sparkle next Christmas. I wasn’t depressed but I learnt from this that we tell ourselves all sorts of restricting ideas, and when we let them go, great and simple happiness can be the result. Best wishes for surviving the ‘SAD’ times – I certainly feel that each June and July down here in Tassie. This is wonderful. It was so tremendous to have your input and perspective from Tasmania, Australia. I am glad you did add some light to brighten your property, and the joy you are finding from it. Our Christmas lights are not overly elaborate (just a string of lights on the front of the house), but they are on each evening for pretty much the entire winter. Yet another great post. It’s very dark up this way. We don’t see the sun until 10AM and it’s gone by 4:00. We no longer do the daylight savings time change either. That will be more noticeable in February. I suffer from SAD. Never knew it was real until it started happening to me. It’s very real. I have to get outside during the day whenever I can. That helps a lot. Fortunately I have Kobi who encourages me to get outside! The community we live in is full of community minded people. That’s why we stay here. It’s really cool to know nearly everyone and to know that everyone is more than willing to help if needed. You are much further north than I am Angie, I knew you would be receiving even less daylight, but I was not too sure how much. I am sincerely sorry that you yourself suffer from SAD. It is good that you have recognized what is going on with your SAD, and are taking the steps to lessen it by making it a priority getting outside for some natural light. I always love your FB pictures of Kobi and yourself running and enjoying your time outdoors. You have a quite a bit of snow. 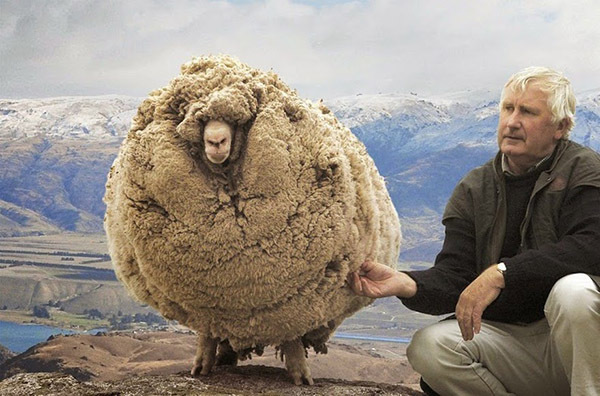 Another fantastic post, Carl. Though I don’t suffer from SAD, I know people who do and it’s definitely a struggle for them. Most of all, I found myself agreeing with you (out loud to my computer) while reading what you wrote about people becoming so individualistic. I was just having a conversation about this the other day. I truly think that 80% of what is wrong with the world today is that nobody cares about other people anymore…everyone is out for themselves. And making it even worse is that so many kids aren’t taught to interact with actual humans anymore…everything is texting, online, Facebook, video games, etc. While the internet is good for many things (without it, where would bloggers like us be? :)) I really think sometimes it has caused more harm than good. I hope that you and your wife are continuing to heal and that this Christmas season brings you all the joy and happiness you deserve! This is such an amazing comment Denise. I guess it is not just me that has been noticing that people have been becoming more and more individualistic. There are many people that still have that “helping mentality”, but it is opposite from the general societal norm. I also agree that technology has played a big part to change people into the way they are. Growing up in Anchorage, Alaska, I am well aware and acquainted with the issues that prolonged darkness and winter days brings. A family member and close friend had SADD. I can be affected by the, “wake up in the dark, go home in the dark,” I found that getting some day time fresh air, walks, or a run in right after work helped me greatly the last couple of years. Happy Blogging to you! Anchorage is WAY up north Rachael Ann. The fresh air and exercise you describe does so much good in alleviating the symptoms, and so glad you are still running. You do really well to keep on top of it. Sincerely hope your friend is managing okay. I meant to say, worn more white and cream jumper, tshirts and tops. I have most of the year and it helps my mood a lot. Colour therapy is the way to go! Hi Carl, we may not have officially met, but my husband and I moved to this wonderful little community in February. We loved the area and thought it would be a good place to start our family. Close enough to town but far enough away that we would get the “small town” feeling. We are settling in, and it took us a while but we are meeting our neighbours and others within our little town. I loved reading your post, and I am so proud of this town. We are the newbies and they have welcomed us with open arms. This “nice little town” has really surprised us. 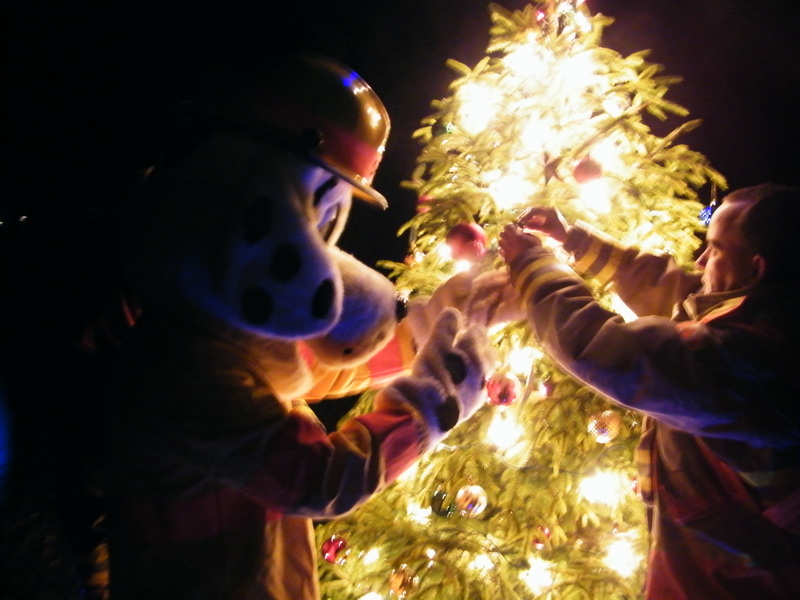 Not only with the tree lighting, but community support. My elderly inlaws live with us and the community has even gone so far as to invite Mom and Dad to a tea social they held at the Public School. Also on Monday, the school students and teachers stopped by to sing carols and deliver a bag of goodies to Mom & Dad. When you see tears in an 81 year old mans eyes because of how greatful they are to be part of this community, I know in my heart moving here was the best decision we have ever made. We have put our roots down here and joined the hall & recreation board so we are more involved with the community. We really do have a great little town here. We are expecting our first child in the New Year and I can’t think of anywhere else I would rather raise our family. Hope to see you in the future Carl, will hopefully be able to get running again not long after baby comes. I’m sure our paths will cross. Sending much love and blessings to all and a very Merry Christmas. Sandra, thank you. I am very touched that you not only took the time to read, but to respond with such a beautiful, well thought out and articulated comment. It makes me very happy that you are loving our little community, are meeting your neighbours, and are also becoming involved with the hall and recreation board. With your new baby on the way as you mentioned, this is a sacrifice of time, and I want to thank you. There is so much good to be said about our little school. When my wife and I 1st moved to Hillsdale 23 years ago with an 8 month old, there was serious talk about closing the school. Then a couple of years later there was the 1st phases of the new subdivisions starting at Marlow and McFadden, and with young adults starting families started moving in across the highway, the school got renewed life. The school has been so wonderful. Loved what you shared about the carolers, and the tea social and how much it meant to your Mom and Dad. Brought tears to my own eyes reading this. Wonderful post! Gosh so many things I want to respond to- but I will keep it to four! First / have heard much about SAD and agree the sunshine is crucial – and many folks i know insist taking Vitamin D3 helps tremendously – as do a few other things – like sun lamps (and wow to how we have moved indoors for work) – anyhow the D3 reminds me of the second response – I love the community stuff U noted with the Amish – and when my aunt visits my cousins she never wants to leave because she always goes during baseball season and the games and practices are a highlight for her – anyhow – I think much of the social Problems we have are timeless in a way – and some of the OT stories highlight this – with envy – stealing birthrights – blended family strife like with Joseph’s older brothers and all that – and so I remember that when stuff arises and try to have a short memory for offenses (with wisdom of course) and with christ’s residence am able to truly forgive and love so freely – anyhow – very good points you make about community – and must be so cool to live in the same house for 25 years! WOW, this is an amazing response Yvette. Thank you for taking the time to read and comment with such great detail and passion. haha….I am picturing the strips of reflective tape on the clothing. It would really work.. Thank you for another interesting and thought-provoking piece. I recognize the lack of daylight issue from where I live in Copenhagen, but rejoice in the fact that we will turn the corner of darkness tomorrow. Merry Christmas and Happy New Year. Denmark would definitely have that lack of daylight issue this time of year. And yep, tomorrow is the big day when we do turn that darkness corner. I appreciate you taking the time to read, and for your kind words. This is a great point about “community”. We rarely come together and have conversations. We barely spare a glance at the cashier. There was a time when we used to have monthly meets and now it has been years since anything has happened. Our local grocery store is still there and we have such great relations that they are invited to weddings! Daylight really is not a problem in India but we have stopped making the most of it. There is sunshine on my laptop wallpaper but rarely get to spend time on weekdays in it. And that sunshine is really needed to get out f the darkness that forms in the head – physical aspects do play a very important role in guiding your mental health. Great post! I really enjoyed reading your thoughts from India Prajakta. It made me very happy to read your local grocery store is still very much a part of your community. Hopefully they will continue to always be a vital part there. But also sad to read there are some things changing in India as well, with less conservations and fewer get togethers. I am curious if this happening as India is becoming more and more modern. Such an incredible point how computers are keeping people from spending time outside in the sunshine. So many jobs do involve computers now, all across the world, and this will not change anytime soon. And WOW, “Sunshine is really needed to get out the darkness that forms in the head” is such a powerful statement Prajakta. So much truth in that. A lot is because of the rapid fire development happening over here, as virtual reality takes over. But it is restricted to urban parts – in rural, we still are living about 50-60 years behind times in many areas. It is a mix.. Thanks for sharing. This is so fascinating. As you might know, my wife was born in India back in 1966 and lived there until she was 9. She always wondered if she would recognize it at all. It was a village, more leaning towards rural. It might not have changed as much as we are thinking. Wow, this is amazing Prajakta. The state is Tamil Nadu in South India. She was born in Erode, and her last bit of time in India was in Salem. Lynne went to a boarding school, which was a bit north in the Nilgiri Hills at a place called Coonora. This is very, very kind of you Prajakta. So I poked around a bit and I actually do know someone from Erode 🙂 It is a bustling city now and I think the parts that she remembers might have been refurbished. Nilgiri Hills continue to invite people into its scenic beauty – I can imagine it would have been almost magical back then. Prajakta, you are so kind to contact acquaintances you know, and how amazing you know someone from Erode. It would be interesting to go there with her, and to see Lynne’s reactions to the changes. I love this. Community is so important, and is dwindling rapidly. Happy holidays to you! Hi Carl! Loved this post. Your reference to the Amish community reminds me of an experience I had with a community in Canada called The Twelve Tribes. It was very different from the increasing individualistic culture in America. Everyone contributed to the community as a whole. Some people would go to work in the deli to bring in money, some ladies would babysit the kids while other moms would prepare food or do other household chores. Although it requires a lot of compromise, it also ensures someone always has your back. And when they get old, there will be community members caring for them without the expense of a nursing home. And as for December being the darkest month there, yikes! In Southern California, it’s usually light when I leave for work, but dark by the time i get home. Thank you so much for reading and sharing this valuable input. The Twelve Tribes would in the fullest sense is a community. I live in Canada myself, but I don’t know that much about it, except for the odd snippet from the outside media. I live Central Ontario, a fair distance from Manitoba. Enjoyed reading this, from someone who has had some experience from within the community. So much good can come of this. A sense of belonging, and a feeling of self worth. Love the fact that others have your back right into the years of being elderly and aged, when they themselves are not able to contribute as much. You are so right. I have got to incorporate being community minded into my writing in 2016. This is inspiring! Happy new Year!! SAD was a problem where I came from, and a huge part of why I moved to Los Angeles. My then-future BIL thought it was silly that I’d get depressed “over something like the weather,” but came to experience it himself as the years go by. I greatly miss having my siblings nearby, but don’t at all miss feeling weather/darkness related gloom for more than half the year! I grew up without much of a community. My community pretty much extended as far as my siblings, though it felt a little more expansive when I started mentoring in college. Growing up, I’ve continued seeing myself as community-less in offline world and connected to a true community via blogging. I only becoming aware of a sense of missing recently. My new work is helping me understand a little better what it means to be a part of a community … and to see how much I want that for my kids. Maybe one of my goals for the year should be focusing on finding communities to be part of their support system. Deborah, thank you for reading and sharing such a well versed comment. The days are now starting to get longer now in Canada, though there will not be anything real noticeable for at least a month. Los Angeles would be a wonderful place to relocate. There is a definite community in the blogging world. (even as we are connecting right here). I am really glad your new work is providing a sense of community in the off-line world. So important to have that belonging and connection. And also important for a child’s self worth.